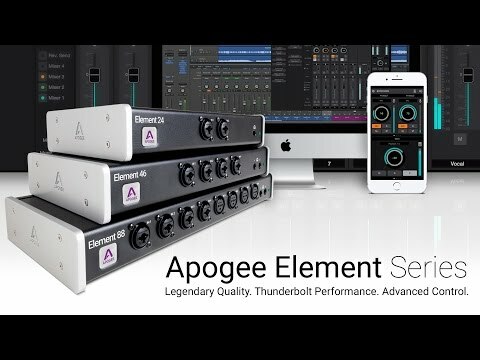 Apogee’s Element 46 is a Thunderbolt audio I/O box made for creating music on your Mac. Element 46 takes the best of cutting-edge Apogee gear like Symphony I/O Mk II, Ensemble Thunderbolt and Groove and puts it into a simple form factor. With streamlined hardware features and advanced software control, Element 46 delivers ultimate recording quality and performance at an unprecedented price. Element 46 is great for any collaborating musician recording at home, on the go or in a small project studio. With 4 analogue inputs (including 4 world-class mic preamps), 2 headphone outputs and stereo speaker outputs, Element 46 is the perfect upgrade from an entry level audio interface. Element 24 is built to be controlled by a powerful software eco-system. With the Element series you have more control options than ever before. Access all I/O controls and settings for your Element hardware with Element Control, Apogee’s software control application for Mac. Use the app to select your input type, adjust input/output levels, configure up to 3 different low-latency mixers and more. You can also use the arrow keys on your keyboard to quickly select any input or output and adjust the level. With Element Control’s Essentials window, you’ll see just the hardware settings you need in a form that requires minimal screen space. Move the Essentials window under, over or to the side of your DAW window for lightning access and total control. Your workflow will be uninterrupted as you keep your focus on the computer screen. Element Control Mobile for iOS provides you with wireless control of the hardware settings included in the Element Essentials Window. Download the iOS App from the App store to your iPad, iPhone or iPod touch. When you’re using Logic Pro X, you can set Element input settings like gain, input source and more directly from with Logic’s Channel Strip, for the ultimate integrated system. Element’s I/O settings are saved with each Logic session, for instant and effortless recall. 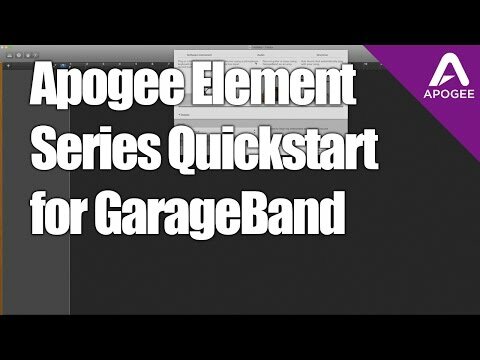 Hi and welcome back to the Apogee Element Series Video Tutorials In this video, we introduce the Apogee Control hardware remote accessory, and demonstrate some of the ways it enhances your workflow. If you absolutely, positively must have a physical control under your fingertips, then you’ll want to check out Apogee Control. Using just the 3 Control Knob focus buttons and the large Control knob, you can access any Element level setting with just a few taps. For example, to set Input gain, tap the Input focus button once, then turn the control knob to the desired gain setting. The selected input is indicated in the Remote’s LED window and in Element Control using the orange Focus ring. To choose another input, simply tap the input focus button repeatedly until the desired input is selected. The headphone output levels are just as easily accessed using the headphone focus button, which toggles through all available headphone outputs. The speaker focus button provides instant control over the speaker level, a handy feature when you need to adjust volume quickly. The eight user-assignable buttons plus the Control Knob tap can be set to perform a wide variety of operations, some of which are exclusive to the hardware remote. To assign button functions, open Element Control software, then click the Toolbar Remote button or choose Remote in the Window menu. In the Assignments window, click on any button to assign its function. There’s a very wide variety of functions available, input settings such as Analog level, 48 volt phantom power, soft limit and more. You can even set button so they directly select specific inputs for the most immediate access. Also available are typical Monitoring functions like mute, dim and sum to mono, Reference level set, Talkback, and speaker switching on Element 88. You can even launch Element Control software with a button. 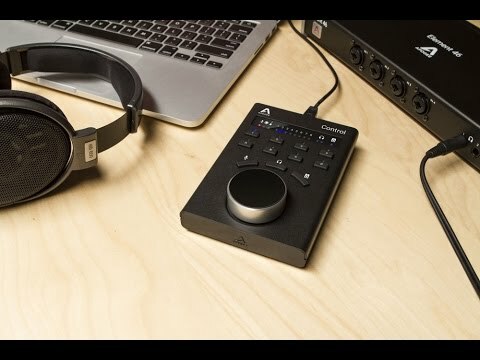 So, if you can’t live without hardware buttons and knobs, Apogee Control is the best way to provide instant access your Element series interface from right under your fingertips. Recorded with Apogee Element 46 and Logic Pro X. 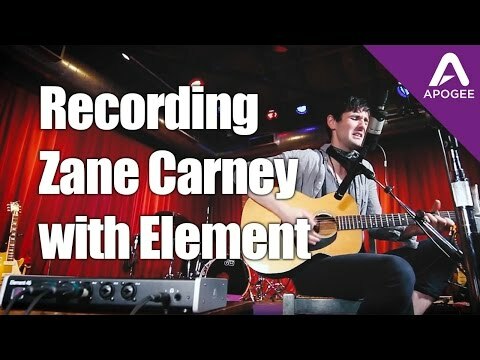 We used a Shure SM57 on Acoustic Guitar and Sennheiser MK8 on Vocal Listen to the full song and download the Logic Pro X session here: http://www.apogeedigital.com/video/recording-zane-carney-with-apogee-element-46 I think I’ve been playing guitar for almost 22 years now. So I started when I was negative one. Because we’re in hollywood right- I’m 21 (laughs). My name is Zane Carney, and I was born in New York City and I live in Los Angeles California now. 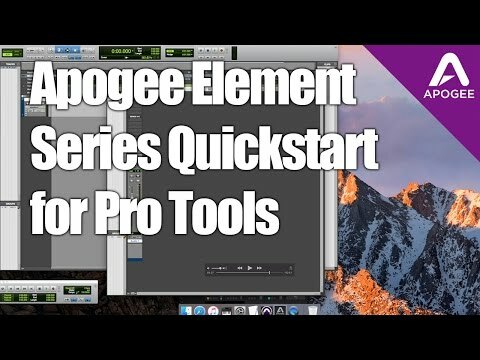 I have a few Apogee products. I have the Apogee MiC. I have the Apogee JAM. On tour I tend to not record too much but obviously its great for that. If you're on the road-just plug it in. I have the One. I have an Apogee Duet. 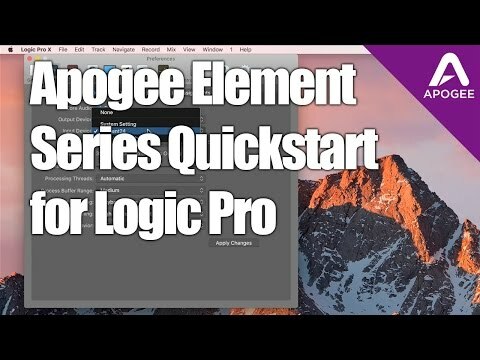 Using a product like the Apogee Element takes away a lot of what makes me crazy about engineering. The more knobs and levers, the more nuts I go. The video you're seeing of me right now, singing these songs, you’re hearing the work that I”ve tried to put into my craft and it just goes straight into the interface, and then you hear it. I’d rather have something that someone has taken the care and consideration to make it sound excellent, and they trust me as a musician to communicate thru that instrument. 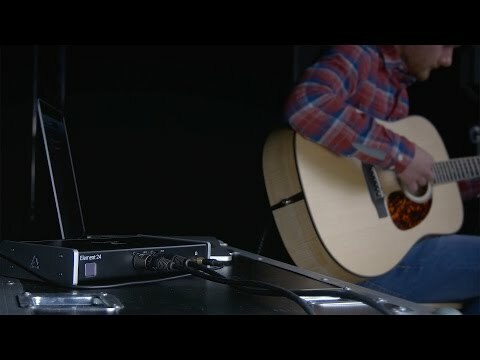 Learn more about Apogee Element: www.apogeedigital.com/products/element In this video, we’ll show you how to use your DAW’s high quality reverb in Element Control’s low latency mixer. We all know the story - you’ve finished your backing track masterpiece, your DAW buffer set to its highest setting, and now its time to overdub the singer. To overcome the higher latency that occurs with a high buffer setting, you’ve set up direct monitoring through Element Control. What’s the first thing every singer asks for? Reverb. Most likely, the highest quality reverb in your system is found in your DAW plug in collection, but how can you use it with direct monitoring? The answer is Element Control’s FX Send, that offers a convenient way to route a signal tap from Element hardware inputs directly to your DAW reverb To get started, let’s assume you’ve created a track in your DAW onto which to record a vocal. Next, set up a reverb send from this track to a separate reverb return using your favorite plug-in. 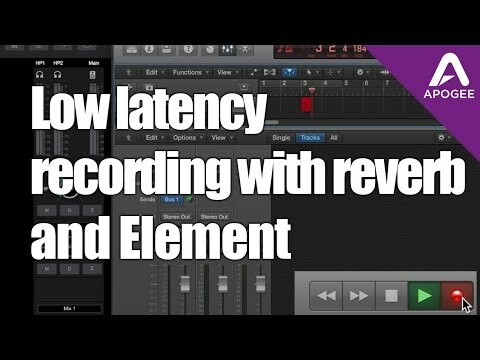 Since software monitoring is turned off, the reverb send isn’t active when the track is in record, but is active during playback. So this is all you need to play back your recorded track back with reverb once its recorded. But how to hear reverb while you’re recording? First, let’s create an Aux input in your DAW to accept the Element FX Send input and route it to the same reverb send used for the initial track. The output from this channel isn’t needed, so set it to No Output. In Element Control, raise the FX Send fader on your vocal input channel, plus the FX Send Master. The mic input signal is now routed directly to DAW reverb input, while the reverb output is mixed with other playback signals and returned to the Element Control mixer. In essence, you’ve created two sends to your reverb, one that sends the playback track to the reverb, the other that sends With this simple setup, you’ll be tracking those critical vocals with virtually no latency and the highest quality reverb. In this video, we’ll show you how to set up your Element, and start recording. 1. Download and install the Element Control software. 2. After your mac restarts, connect the Elements power supply. Connect your Element to your mac using a Thunderbolt cable. 3. Update the firmware if prompted. 4. Click Yes to use the Element as your mac’s I/O. 5. If this dialog does not appear, confirm the settings in system preferences/sound 6. If the Element Control App doesn’t launch automatically, launch it from your applications folder. 7. Close any open windows. 8. Go to the window menu and select Essentials. 9. Turn the monitors all the way down. 10. Turn the Main output level in Essentials all the way up. 11. Play back a song from iTunes, and slowly raise the monitor level until the music coming out of your monitors is at the maximum volume you would ever listen to. 12. Back off the main output level in the essentials window until your at a comfortable listening level. 13. If the audio sounds distorted, open the Primary window and select -10dBV in the Main Output Level menu. 14. Close the Primary window and set the Main output level to a comfortable listening level. 15. Stop playback of audio and close any apps you have open besides Element Control. 16. Before setting up your input, turn down the Main Output all the way. This will prevent feedback when using microphones. 17. Connect your input source to your Element. The 1/4 inch jack can only except input from instruments. So if your using a mic, make sure to use an XLR cable. 18. Select the input type-Mic, Instrument, or a line level setting +4dBu or -10dBV. These are used for sending a signal from another audio device. If your mic needs phantom power, engage the 48V button on the input your using. For basic recording, you will not need any the other buttons in the Essentials window, but if your curious, select Hover Help from the window menu and read about each button as you hover your pointer over them. Keep in mind that you shouldn’t be hearing your input yet. Were going to set proper input levels first. 19. Perform on your instrument or mic as you normally would, and raise the input gain until the signal in the meter is about 3/4 of the way up. If you see the orange over light, lower the gain. 20. Open your DAW and select Element as the input and output device. 21. For low latency recording, set your buffer to 64. 22. Create a new session and an audio track. 23, Select Input 1 and set output for stereo output. 24. Go to the audio track you just created and engage Input and Record Enable. 25. Put your headphones on. You can start with the headphone level at -40dB. Speak into your mic or play your instrument. You should hear yourself in the headphones. If the volume is too low, turn the headphone level up. We’ve already set up the input gain to a good level so it won’t clip or distort. So from this point on we should on adjust output levels when things are too quiet or too loud. 26. You are now ready to start recording. 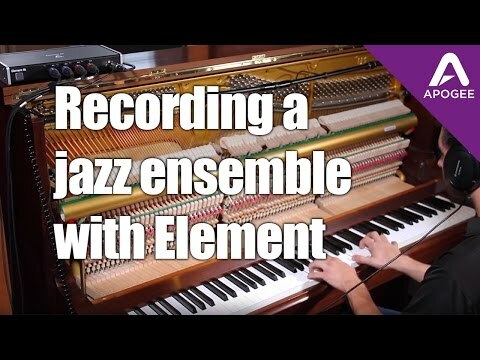 In this video, we’ll show you how to set up your Element, and start recording. 1. Download and install the Element Control software. 2. After your mac restarts, connect the Elements power supply. Connect your Element to your mac using a Thunderbolt cable. 3. Update the firmware if prompted. 4. Click Yes to use the Element as your mac’s I/O. 5. If this dialog does not appear, confirm the settings in system preferences/sound 6. If the Element Control App doesn’t launch automatically, launch it from your applications folder. 7. Close any open windows. 8. Go to the window menu and select Essentials. 9. Turn the monitors all the way down. 10. Turn the Main output level in Essentials all the way up. 11. Play back a song from iTunes, and slowly raise the monitor level until the music coming out of your monitors is at the maximum volume you would ever listen to. 12. Back off the main output level in the essentials window until your at a comfortable listening level. 13. If the audio sounds distorted, open the Primary window and select -10dBV in the Main Output Level menu. 14. Close the Primary window and set the Main output level to a comfortable listening level. 15. Stop playback of audio and close any apps you have open besides Element Control. 16. Before setting up your input, turn down the Main Output all the way. This will prevent feedback when using microphones. 17. Connect your input source to your Element. The 1/4 inch jack can only except input from instruments. So if your using a mic, make sure to use an XLR cable. 18. Select the input type-Mic, Instrument, or a line level setting +4dBu or -10dBV. These are used for sending a signal from another audio device. If your mic needs phantom power, engage the 48V button on the input your using. For basic recording, you will not need any the other buttons in the Essentials window, but if your curious, select Hover Help from the window menu and read about each button as you hover your pointer over them. Keep in mind that you shouldn’t be hearing your input yet. Were going to set proper input levels first. 19. Perform on your instrument or mic as you normally would, and raise the input gain until the signal in the meter is around 3/4 of the way up. If you see the orange over light, lower the gain. 20. Launch Pro Tools 21. If the Dashboard window appears, click cancel. 22. Click the Setup Menu and goto Playback Engine. 23. Confirm that Element is set as the Playback Engine. 24. For low latency recording, set your buffer to 64. Click ok. 25. Go back to Setup and select I/O. 26, Click the Default button in the Input, Output and Bus tabs and then click ok to exit. 27. Go to the File menu to open or create a new session. 28. To create a new track, hold down shift and command and press the N key. You can also do this from the track menu at the top. Leave it set for Mono and click create. 29. Go to the Mix window and find the track you just created. Make sure you have selected Analog 1 for your input and playback 1 & 2 for your output. 30. Engage the Input and Record Enable buttons. 31. Put your headphones on. You can start with the headphone level at -40dB. Speak into your mic or play your instrument. You should hear yourself in the headphones. If the volume is too low, turn the headphone level up. We’ve already set up the input gain to a good level so it won’t clip or distort. So from this point on we should on adjust output levels when things are too quiet or too loud. 32. You are now ready to start recording. In this video, we’ll show you how to set up your Element, and start recording. 1. Download and install the Element Control software. 2. After your mac restarts, connect the Elements power supply. Connect your Element to your mac using a Thunderbolt cable. 3. Update the firmware if prompted. 4. Click Yes to use the Element as your mac’s I/O. 5. If this dialog does not appear, confirm the settings in system preferences/sound 6. If the Element Control App doesn’t launch automatically, launch it from your applications folder. 7. Close any open windows. 8. Go to the window menu and select Essentials. 9. Turn the monitors all the way down. 10. Turn the Main output level in Essentials all the way up. 11. Play back a song from iTunes, and slowly raise the monitor level until the music coming out of your monitors is at the maximum volume you would ever listen to. 12. Back off the main output level in the essentials window until your at a comfortable listening level. 13. If the audio sounds distorted, open the Primary window and select -10dBV in the Main Output Level menu. 14. Close the Primary window and set the Main output level to a comfortable listening level. 15. Stop playback of audio and close any apps you have open besides Element Control. 16. Before setting up your input, turn down the Main Output all the way. This will prevent feedback when using microphones. 17. Connect your input source to your Element. The 1/4 inch jack can only except input from instruments. So if your using a mic, make sure to use an XLR cable. 18. Select the input type-Mic, Instrument, or a line level setting +4dBu or -10dBV. These are used for sending a signal from another audio device. If your mic needs phantom power, engage the 48V button on the input your using. For basic recording, you will not need any the other buttons in the Essentials window, but if your curious, select Hover Help from the window menu and read about each button as you hover your pointer over them. Keep in mind that you shouldn’t be hearing your input yet. Were going to set proper input levels first. 19. Perform on your instrument or mic as you normally would, and raise the input gain until the signal in the meter is about 3/4 of the way up. If you see the orange over light, lower the gain. 20. Launch GarageBand. 21. To create a new project, select Empty Project and click the Choose button. 22. Since we are going to record with a mic, make sure the microphone is selected. 23. Click the little arrow at the bottom left and then choose Element as your output and input device. 24. Close the Preferences window and check the box beside I want to hear my instrument as I play and record. 25. Make sure input 1 is selected in the input menu. 26. Click Create. 27. Put your headphones on. You can start with the headphone level at -40dB. Speak into your mic or play your instrument. You should hear yourself in the headphones. If the volume is too low, turn the headphone level up. We’ve already set up the input gain to a good level so it won’t clip or distort. So from this point on we should only adjust output levels when things are too quiet or too loud. 28. Now you are ready to record. Click the Record button, wait for the four beat count in, and begin recording. In this video, we’ll show you how to set up your Element, and start recording. 1. Download and install the Element Control software. 2. After your mac restarts, connect the Elements power supply. Connect your Element to your mac using a Thunderbolt cable. 3. Update the firmware if prompted. 4. Click Yes to use the Element as your mac’s I/O. 5. If this dialog does not appear, confirm the settings in system preferences/sound 6. If the Element Control App doesn’t launch automatically, launch it from your applications folder. 7. Close any open windows. 8. Go to the window menu and select Essentials. 9. Turn the monitors all the way down. 10. Turn the Main output level in Essentials all the way up. 11. Play back a song from iTunes, and slowly raise the monitor level until the music coming out of your monitors is at the maximum volume you would ever listen to. 12. Back off the main output level in the essentials window until your at a comfortable listening level. 13. If the audio sounds distorted, open the Primary window and select -10dBV in the Main Output Level menu. 14. Close the Primary window and set the Main output level to a comfortable listening level. 15. Stop playback of audio and close any apps you have open besides Element Control. 16. Before setting up your input, turn down the Main Output all the way. This will prevent feedback when using microphones. 17. Connect your input source to your Element. The 1/4 inch jack can only except input from instruments. So if your using a mic, make sure to use an XLR cable. 18. Select the input type-Mic, Instrument, or a line level setting +4dBu or -10dBV. These are used for sending a signal from another audio device. If your mic needs phantom power, engage the 48V button on the input your using. For basic recording, you will not need any the other buttons in the Essentials window, but if your curious, select Hover Help from the window menu and read about each button as you hover your pointer over them. Keep in mind that you shouldn’t be hearing your input yet. Were going to set proper input levels first. 19. Perform on your instrument or mic as you normally would, and raise the input gain until the signal in the meter is about 3/4 of the way up. If you see the orange over light, lower the gain. 20. 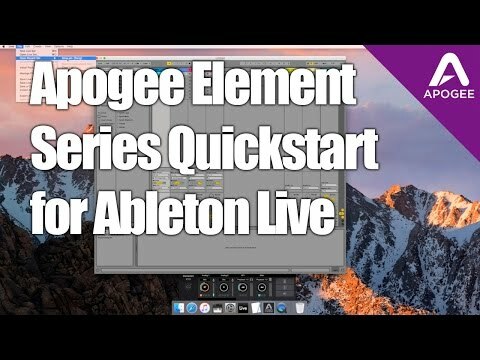 Launch Ableton Live and create a new Live Set or open an existing one. 21. Go to the Preferences and select Audio and confirm the audio input and output device are both set for Element. 22. For low latency recording, set your buffer to 64. 23. Go to Input Config and enable the inputs you want to use. 24. Do the same for the output channels in Output Config. 25. Click the Create Menu or press Command T to insert a new track. 26. Click the I/O button in Live and confirm your audio track is set for external in. 27. Select input 1 and set output for master. 28. Go to the audio track you just created and engage Input and Record Enable. 29. Put your headphones on. You can start with the headphone level at -40dB. Speak into your mic or play your instrument. You should hear yourself in the headphones. If the volume is too low, turn the headphone level up. We’ve already set up the input gain to a good level so it won’t clip or distort. So from this point on we should only adjust output levels when things are too quiet or too loud. 30. You are now ready to start recording.